Schleswig (also known as Schleswiger Heavy Draft, or Schleswiger Kaltblut) horses are from the Duchy of Schleswig, Germany. 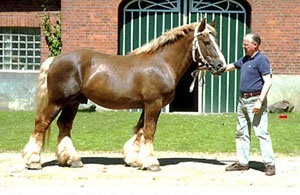 They are thought to be the origin of the Schleseiger Draft Horse along with the Jutland Heavy Draft Horse. Although not a certainty, the Schleswiger Heavy Draft's ancestors not only worked in agriculture tilling and pulling, but the Schleswigers probably descended from the large war horses of the Middle Ages. In 1860 an imported English stallion, Oppenheim LXII, either a pure-bred or a part-bred Suffolk Punch, was introduced, and became the foundation stallion of the breed. In 1888 the breeding of warmbloods and coldbloods was separated, and in 1891 various associations of coldblood breeders in Schleswig were brought together in the Verband der Schleswiger Pferdezuchtvereine, and systematic breeding began. The brand V.S.P in an oval on the off hindleg was chosen to identify registered horses and is still used today. In 1893 the stallion Aldrup Munkedal 839 was born, a son of Munkedal II 585 and a descendant of Oppenheim LXII; he won the king's prize at the Jubilee celebrations in Odense in 1900, and 70,000 crowns were offered for him. Ater the First World War all Schleswig Coldbloods descended from this stallion. By 1910 the Verband recorded 12,000 breeding animals. Through regional agricultural shows, the Schleswig Coldblood became widely known and was sold throughout Germany. Schleswig was divided between Denmark and Germany in 1920, as part of the aftermath of the First World War. That meant the loss of a large part of the breeding area for these horses and was a major setback. However numbers rose again, and in 1949 reached a peak of about 450 stallions and around 25,000 brood mares in the hands of more than 15,000 breeders spread throughout Schleswig-Holstein. In 1958 two French stallions were added to the breeding stock. In the years following the Second World War the mechanisation of agriculture, with the replacement of agricultural horses with tractors, led to a dramatic decline in numbers. By 1976 they had fallen to a low of 35 mares and 5 stallions, and in that year the old society was dissolved and the remaining animals were registered in the Schleswig-Holstein horse register in Kiel. A society for the protection of S chleswig horses was soon formed, and in 1991 this became the Verein Schleswiger Pferdezüchter, or Schleswig horse breeders' association. Since 1997 numbers have remained stable at about 200–250; in 2013 there were 189 mares and 26 stallions. The Schleswig Coldblood was listed as endangered by the Food and Agriculture Organisation (FAO) of the United Nations in 2007. In 2013 it was in Category II: seriously endangered on the Rote Liste of the Gesellschaft zur Erhaltung alter und gefahrdeter Haustierrassen, the German national association for the conservation of historic and endangered domestic animal breeds, and was listed as minimally endangered by the European Association for Animal Production (EAAP). Since 2012 a sub-population, the Hannoversches Kaltblut Schleswiger Ursprungs, or roughly "Hanoverian coldblood of Schleswig origin", has been included in the Schleswiger Coldblood breed; in 2012 there were a total of 62, 4 stallions and 58 mares. Schleswig Horses stand approximately 154 (5 feet 1 inch or 61 inches) - 162 cm(5 feet 4 inches or 65 inches) or 15.2 to 16 hands. The stallions are on average, bigger than the mares. Their legs are strong and dry, lightly feathered. The round hooves are of good quality. The back should be short and well muscled; however, many have backs that are longer than most draft horses. They have deep chests. The head is short and straight with a broad forehead. The neck should be well proportioned. The Schleswiger is usually chestnut colored, although black, grey and bay occur. The Schleswiger is an excellent mover with an astounding walk and trot. The Schleswiger has a good placid character and is very willing to learn. They are versatile, agile and of great endurance, and are easy to keep. Feeding problems are virtually unknown to this breed. They are used for farming and other agricultural endeavors. Hauling loads such as timber, pulling omnibuses, in the brewery business, in nurseries, and for military purposes. They are also used for pleasure.